NEW YORK – It was easy to get lost on Darren Aronofsky’s ark. Inside a converted Brooklyn armory in late 2012, Aronofsky was shooting “Noah” on a massive vessel that matched the biblical dimensions of the boat, its rough beams lashed together and the hull sealed with pitch. In every corner of the three-story structure rested packs of ersatz animals – insects on one level, snakes and turtles in another corner and, around the bend, lions quite literally lying with lambs. “Animals are fragile. Please do not touch,” a sign warned visitors. It took production designer Mark Friedberg’s team four months to construct the interior ark set for “Noah” (he built another, for exterior shots, near Long Island Sound) and much longer for Industrial Light and Magic and Look Effects to create living, albeit digital, creatures that would walk, fly and slither, two by two, into the ark. Yet those tasks were ultimately footnotes in the film’s epic journey to the screen, as Aronofsky and screenwriter Ari Handel labored to expand a brief but revered story into a full-length movie, all without estranging their financiers and the faithful, both of whom worried that “Noah” would be heretical. Opening Friday, the $130 million production marks a departure not only for Aronofsky, whose previous films, including “Black Swan” and “The Wrestler,” were more modest undertakings but also for Hollywood, which in recent decades has exhibited negligible interest in overtly religious stories. The few scriptural hits, including Mel Gibson’s “The Passion of the Christ” and the new “Son of God,” were produced independently. But first Aronofsky’s movie has to prove its doubters wrong. Nearly 15 years ago, as Aronofsky’s experimental sci-fi story “Pi” was about to hit theaters, the filmmaker visited the Museum of Jurassic Technology in Culver City, Calif. Dedicated to the Earth’s history, the fanciful and scientifically creative museum was displaying a small diorama based on Noah’s ark. Aronofsky easily could have walked past it, but the exhibit caught his eye – and imagination. Soon thereafter, he successfully pitched his flood idea to producer Lynda Obst, but when a Jon Voight television miniseries called “Noah’s Ark” came out, Aronofsky’s “Noah” ran aground before he could even write it. By 2003, after the filmmaker’s “Requiem for a Dream” was completed, Aronofsky began working with screenwriter Handel (a college classmate and former neuroscientist) on a “Noah” script. But it was not until after the director’s long-delayed “The Fountain” was released in 2006 that Aronofsky started taking the story around town. It didn’t start well. “Noah” briefly was set up at Universal but lost momentum when studio chief Stacey Snider departed and Universal’s “Evan Almighty,” a $175-million Steve Carrell comedy set on an ark, bombed in 2007. Rather than watch their screenplay perish, Aronofsky and Handel turned to Canadian comic book artist Niko Henrichon, who in 2008 began a painstaking effort to transform their script into a series of graphic novels. When Aronofsky’s “Black Swan” became a commercial hit with more than $329 million in worldwide ticket sales, “Noah” suddenly had fresh energy. But what story would the movie actually tell? From the start of his filmmaking career, Aronofsky had been drawn to obsessive, largely isolated people fighting forces both external and internal, demons real and imagined. Noah, in many ways, represented a similar thread in that narrative tapestry, but his story was unavoidably constrained by His story: Aronofsky and Handel didn’t want to trample on the Bible, but they had to fashion a two-hour tale out of just several Genesis verses in which Noah barely speaks. That foundation needed a structure on top of it. So Aronofsky and Handel fashioned an action story that generously quoted from the Bible, set against a global apocalypse, including giant, mythical beasts – inspired by the Nephilim of the Old Testament that help Noah construct his massive vessel. “We knew we had to be faithful to the text – we couldn’t contradict it,” Handel said. To help dramatize how mankind had fallen, Aronofsky cast the Earth as a character, using exteriors in Iceland to show the planet as barren. The world, and everything in it, was in need of new stewardship, and that environmental message resonated – in mostly the wrong way – with conservative critics. The deluge of doubters ultimately included his own studio. 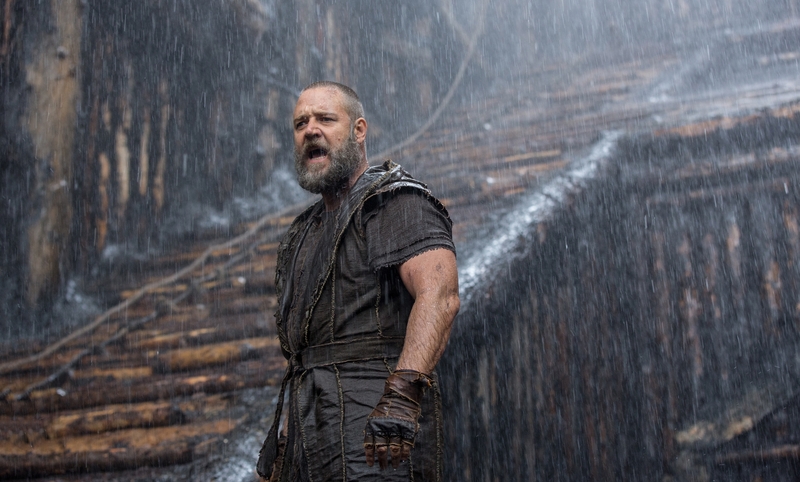 Paramount grew anxious that “Noah” might offend some on the religious right and started testing its own cut of the movie while Aronofsky raced to finish his. Franklin said that even with unfinished visual effects and a rough score, Aronofsky’s version tested better than Paramount’s, even though the studio’s had fewer missing pieces and was more polished.